Little Fistral is a short walk up the Headland from the famous surf spot of Fistral Beach. A local’s favourite, Little Fistral rarely gets busy. It’s not as good for surfing as the other town beaches but is perfect for a swim and snorkel on a calm day or perhaps a spot of sunbathing and a picnic. 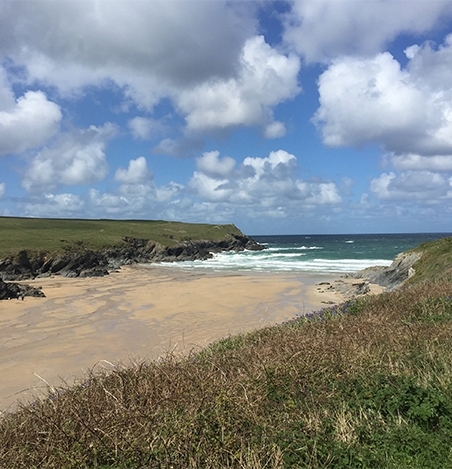 Another of Newquay’s hidden gems, Whipsiderry is a 5-minute walk from Porth beach. The only way to get to the beach is down a steep set of steps that are cut into a stone cliff – this is your only way back up too! Your efforts will be rewarded with delightful rock pools and caves to explore and the surf can be perfect at low tide. Be sure to get a local tide time table as at high tide the water covers the beach entirely. Located between Crantock and Holywell Bay, Polly Joke is another local’s favourite. It’s a short walk to the beach – so it never gets very busy. When the tide is out there are lots of caves to explore and dogs are allowed on the beach all year round. Polly Joke also makes a great starting point for a superb coastal walk where you can often spot seals sunbathing on the rocks. Just be aware that there are no life guards on this beach. The most popular of our selection, Crantock is famed for its long rolling white sand dunes and great surf. On a sunny day you might think you are in Hawaii instead of just around the corner from Newquay. At high tide the River Gannel is great for swimming and paddle boarding although just be careful with the current. The beach itself is sheltered from the wind by the sand dunes and dogs are welcome all year round. We also like that the ice cream van drives around the beach so if you’re feeling particularly lazy you can wait for it to come to you!